Dream, Believe, Achieve: Align Your Values, Purpose & Goals | Ellwood Thompson's Natural Market | Happenings | Style Weekly - Richmond, VA local news, arts, and events. 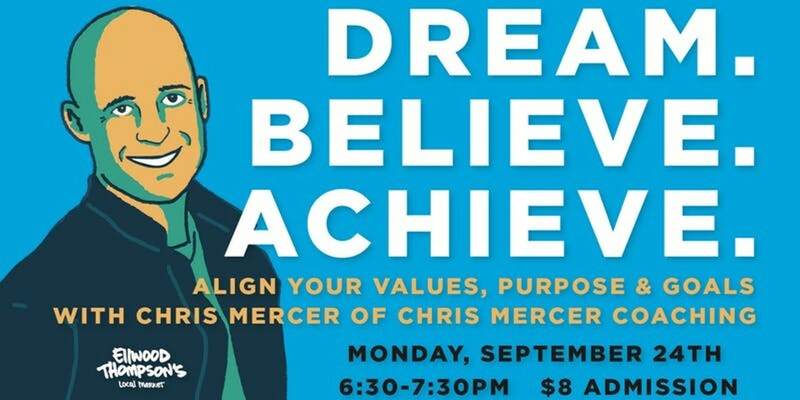 Chris Mercer’s Dream, Believe, Achieve class is an invigorating and streamlined framework for defining your purpose, clearing away roadblocks, and setting you off toward your goals. Whether you are getting started on a new journey or feeling stuck in your current one, this class provides a fun, creative environment for you to develop your ideas, meet other motivated people and start moving forward. This workshop could be a first step toward making your dreams a reality. What have you got to lose? Take a chance on yourself and sign up today!